SNAFU! : Esquire Magazine takes a chainsaw to the F-35's capability and costs! Esquire Magazine takes a chainsaw to the F-35's capability and costs! When we last left our old friend, the F-35 fighter-bomber—a.k.a. The Flying Swiss Army Knife—they were working out the bugs in its ejector-seat mechanism so that the pilot would not be decapitated should said pilot have to exit the vehicle suddenly. There also has cropped up something of an oxygen problem which, if it were unchecked, at least would make the decapitation of the ejecting pilot superfluous. At this point, if you’re keeping score at home, the entire project ultimately will cost you and me your grandchildren and everybody else and their Uncle Fud $1.53 trillion (with a T), which is a projected overrun of $35 billion (with a B). It's a short read but well worth your time. Long story short? This fight is far from over. The Pentagon knows that and so does Lockheed Martin. There is still time to save American air superiority and this article is exhibit 1. 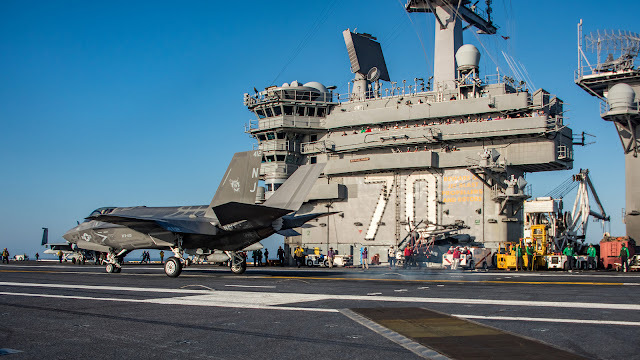 If the Republicans want lower taxes and if a segment of that party wants cost savings/cuts to balance it all out, then the F-35 becomes an obvious target. You thought this F-35 thing was over? This fight is actually just beginning. New prediction. The USAF will get south of 700 of these airplanes.